Early Tuesday morning, the Nikkei Asian Review claimed that at some point soon, the AirPods Wireless Charging Case will somehow connect to the iPhone, allowing for the peripheral to charge the iPhone. At first glance this seems like a decent idea, but besides the source's questionable accuracy, there may be a few road-blocks. Wireless charging isn't the wild west. There are rules and implementation specifics that must be adhered to. One of them is that charging is unidirectional and doesn't need to be negotiated. There are specific charging plates, and there are coils on the device to be charged. On the supporting side, the coil on the iPhone doesn't need to change. It will (likely) always be the charged device. However, it would require a very new technology. Charging direction regulatory circuitry on the AirPods case would need to be developed, and doesn't appear to be allowed at all in the spec. The AirPods Charging Case has a very small battery as compared to the iPhone. The peripheral has a 398 mAh battery. On the low-end the iPhone SE has a 1624 mAh battery, and the iPhone 8 family has about a 1850 mAh battery. Given losses, a full AirPods Charging Case as it stands would deliver about a 1/8 charge to those phones at an unknown rate, and would likely be limited to 5 volts. Giving a dead iPhone enough charge to be able to make a 30-second call at 5 volts takes about two minutes —an eternity in an emergency. The idea isn't a bad one, and would allow users to use the charging case in an emergency, but it seems unlikely. In theory, Apple could work around the unidirectional requirement for Qi with some kind of charge negotiation like happens with USB-C. But it's specifically not allowed in the current version of the Qi spec, and may break backwards compatibility. 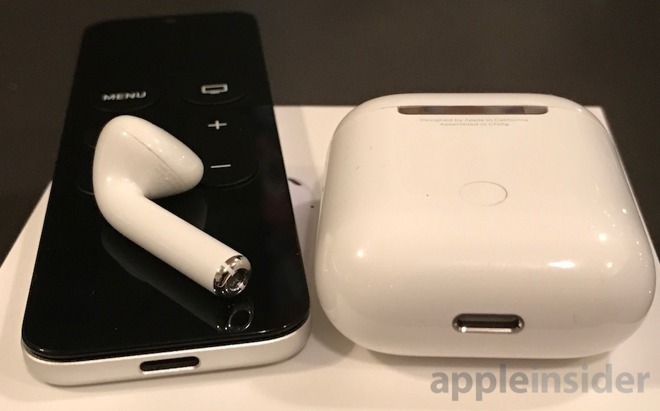 Furthermore, it could swap the Lightning connector for USB-C to a future version of the AirPods charging case —but Tuesday's report would still be in error as it would no longer be a wireless charge method. From a practicality standpoint, there are iPhone-boosting batteries that hold a full charge, and occupy less room than an AirPods case does. And, they cost a lot less money than the AirPods do. At least for now, Tuesday's report looks like a misinterpretation of what is known about the AirPower charging mat and Apple's wireless charging at best, and more erroneous reporting from the Nikkei Asian Review at worst.